Despite the fact the families live in transient and face challenges in all aspects of their lives, some 200 children have found a sense of belonging through a love for music by singing with Nai. On their journey to becoming new Canadians, the children learn songs from Syria and the Levant Region, but they also learn songs of a multicultural Canada, their new home. While some children still struggle with communicating in English, they all keenly learn English songs and a variety of songs in other languages. The children attend weekly choir sessions where professional musicians, conductors and educators lead the Nai kids through musical and community building activities. In moments when we see a glimmer in the children’s eyes, laughter in their hearts, elation in their spirit, and collective awe by the beauty of the sound we have just made, we feel a greater sense of belonging and a spark of hope. This Canada Day Concert at the Aga Khan Museum is CultureLink Nai Children’s Choir’s first formal concert presentation since it was established two and a half years ago. We want to show the world what is possible with refugee children who were deprived of years of schooling and who never learned to sing before they came to Canada. Nai Children’s Choir will be joined by Jawa Band whose members have been instrumental to Nai’s growth. Java Jawa Band is also exclusively comprised of Syrian newcomers. The songs of Nai and Jawa Band reflect both the musical history of Syria and music as a living tradition evolving in a diaspora community where singers and instrumentalists negotiate new identities and weave unique elements of Syrian music within Canada’s multicultural and classical music soundscape. Nai Choir will also be joined by Syrian American rapper Mona Haydar. Growing up in a Syrian diaspora community in the US, the music of Mona Haydar, the famed “Hijabi Rapper”, too, is deeply rooted in an intersectional identity. Mona supports Nai’s cause and sympathizes with the situation where Nai was prevented from travelling to the States to participate in Serenade! - an international choral festival in Washington, D.C. By coming to Toronto to collaborate with the Nai children, Mona shows her unwavering defiance against bigotry and racism, and brings messages of unity and social justice beyond borders. In the spirit of inclusion, diversity and interconnectedness, this Canada Day concert is an opportunity for Nai not only to give back to the community by showcasing the intricate diversity of Syrian culture, but also puts a human face on a number of pressing global issues, letting a bright hopeful note of unity to be heard amongst the loud squabbles that divide. Audiences will see this theme exemplified in the premiere of a new choral piece “Rise Children! Let’s Rise to Peace”* composed by Hussein Janmohamed, the Artistic Director of the concert, who in collaboration with youth and professional musicians expertly layers children’s voices, classical music, folk idioms and hip hop into a unified whole. Weaving the rich musical history of Syria with choral and contemporary culture, this concert presented by the Nai Children’s Choir will show us what is possible when music, a universal language, becomes a platform for dialogue, collaboration and shared exploration of our new collective identities. So come to Nai’s Canada Day concert at the Aga Khan Museum on Sunday, July 1st. Let you heart be filled with children’s smiles and indulge your ears to a feast of and delight in their sound. 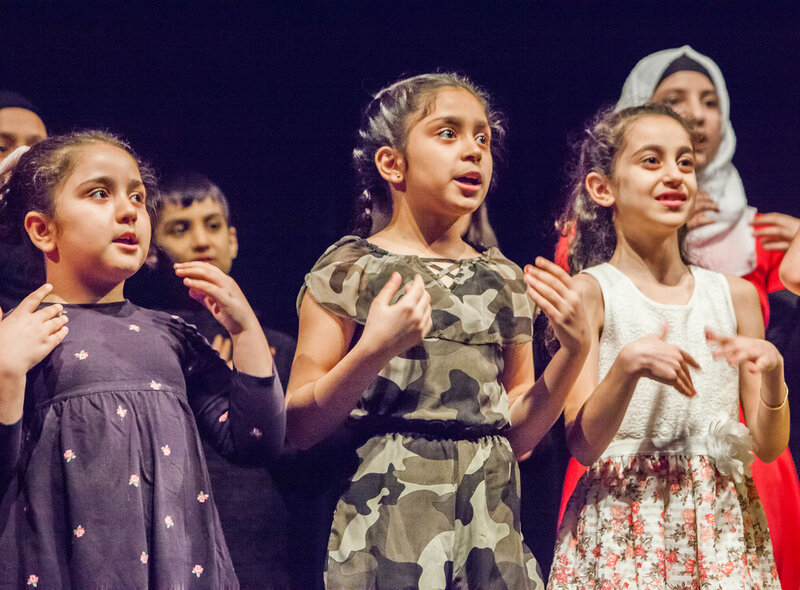 The Museum offers ticket buyers an opportunity to participate in the work of the CultureLink Nai Children’s Choir and supports the Syrian newcomers’ community directly. Click through to the ticketing screen and you’ll find a pricing option of $50. When you purchase a ticket at this price, you receive your own ticket for the performance; in addition, you enable a family member of Nai choristers to attend.